My fall planted garden of cool-season flowers, vegetables, and herbs safe from wind, pest, and varmints under covers. Floating Row covers can prevent so many problems in the garden, I’m not sure if I would still be gardening if it wasn’t for them. They help prevent pest damage, protect plants from the elements and so much more. I am never caught without row covers on hand. Covering plantings of flowers, herbs, and vegetables using hoops, floating row cover (no plastic) along with anchor bags is easy to do and use. I steer away from plastic because it needs far more day-to-day attention than a simple floating row cover does. When I feel the need for extra protection I just double this lightweight cover. 85% of air, water, and light penetrate this lightweight row cover, so no need to remove during the day. I find that most folks, both seasoned and beginner gardeners, underestimate how powerful a lightweight floating row cover can be. The simple act of blocking wind, protecting seeds from birds, or keeping a pest out can be the difference between success and failing. Row covers are one of my top go to tools. First, some caution when using floating row cover during the warm-to-hot season. On a bright sunny day with temperatures warming up outdoors, the heat under a row cover climbs. If you add to this equation the black side up on the biodegradable film, it can become a overheating disaster in a very short time. This very situation is a gift during the cool-season, but has to be managed differently in warm-to-hot weather. 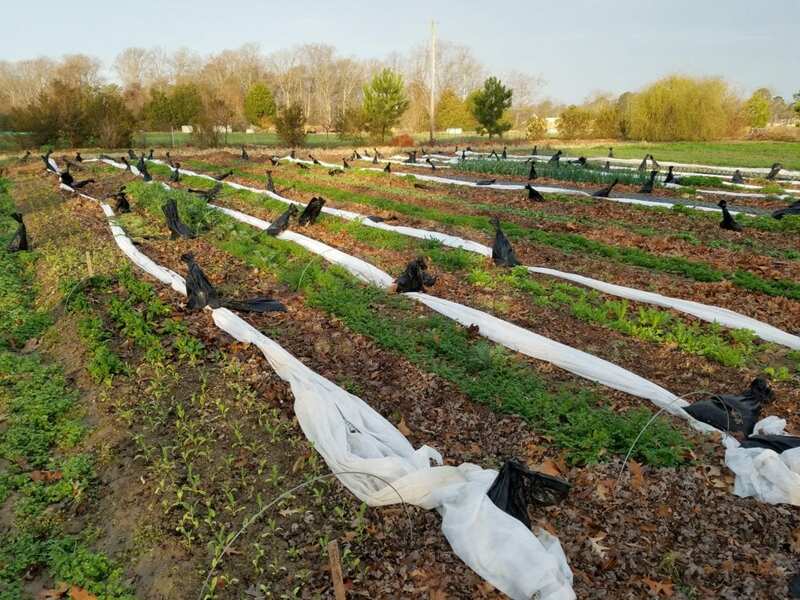 The first planting of warm-season tender annuals in the ground and were immediately hooped and covered to protect against the cool spring winds and nighttime chills. My most common use of a floating row cover heading into warm weather is to keep plants warm. We plant our first transplants of warm-season tender annuals outdoors on our last expected spring frost date. This is risky if you don’t take steps to provide protection because while it may not freeze it can still be chillier than these plants want. We make beds weeks before planting so the black side of the biodegradable film has time to start warming the soil. We plant and immediately hoop and cover with a floating row cover. This intensifies the sun and protects seedlings from the cool spring winds and makes for warm growing conditions. I monitor the outdoor temperatures to be sure we aren’t toasting our transplants. If temperatures go above 80 degrees I take down the covers for ventilation during the day. It’s the afternoon highs on a sunny day you must keep your eye on. If in doubt and you have to leave home, uncover and recover later. 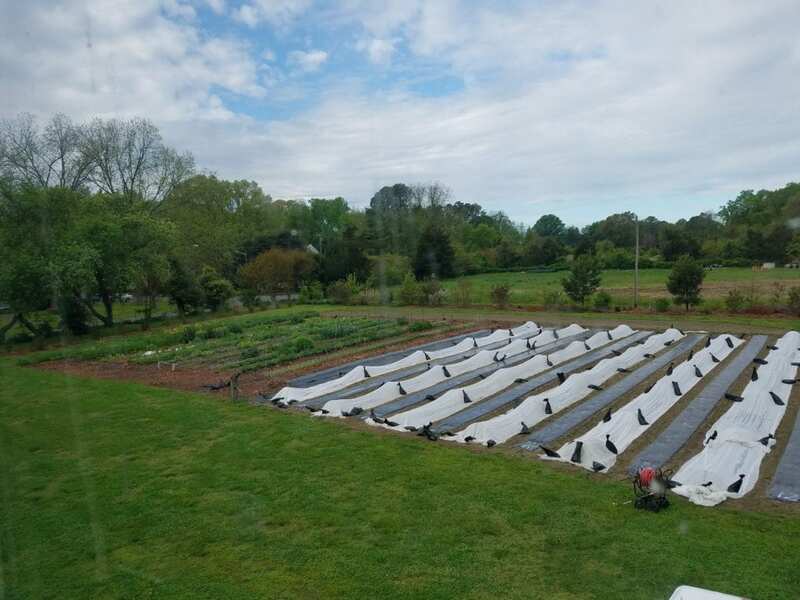 During the heat of summer when temperatures are above 85 degrees we transplant into beds made with the white side up on the biodegradable film. We do not cover with a floating row cover. These seedlings have been hardened off for the recommended 5-7 days before being planted. Covering with a floating row cover poses to much of a risk of overheating. When planting seeds directly in the garden it is beneficial to cover the seed bed with a floating row cover immediately following planting. It is not necessary to use hoops for this short term use. The cover protects the seeds from birds and increases germination because it retains moisture by protecting the soil from surface wind. My cool season gardens of fall, winter, and early spring have grown to be my most enjoyable gardens. It’s easy to jump into cool season gardening when you have what it takes to make easy low tunnels that offer added protection from the elements. We plant many cool-season vegetables in late summer to harvest in the fall. Many of them will keep on producing through winter if harvested on a regular basis and given a little wind protection. Lettuce, kale, chard, spinach, and others will survive winter under hoops and a floating row cover to jump back into action once very early spring comes around. Always take row covers down when snow is forecasted. A row cover with snow on it will collapse and smoother the plants beneath it. Snow is an excellent insulating blanket so no need to worry. Most of our cool-season hardy annual flowers from my book Cool Flowers are transplanted in fall and early winter into beds made with the black side up of the biodegradable film. The heat generated from the sun on the black film encourages strong root growth throughout winter. Hooping and row covering intensifies this beneficial affect. I use hoops and floating row covers when nighttime temperatures begin dropping below 28 degrees. If several warm days come going above 55 degrees and sunny, I temporarily uncover to prevent plants from growing to big before their season. I put covers backup when below freezing temperatures return. My fall planted Cool Flowers garden uncovered in February during a warm spurt to do some weeding and to ventilate to prevent overheating. Uncover beds in very early spring when the threat of hard freezes has passed. Pull the covers off, but leave in the garden just in case a hard freeze comes. In my book Vegetables Love Flowers I share the lesson I learned years ago on how to prevent damage to my bush bean plants by the Mexican bean beetle pest. I learned to cover the bean seed bed with hoops and row cover immediately following planting the seed. The bed is only uncovered for weed preventing chores until the plants are in full bloom and preparing to bear beans. At this point of growth, uncovering and leaving it off does not allow enough time for the beetle pest life cycle to reproduce enough to cause any significant damage before the harvest is done. After years of following this pest preventing practice, we now grow beans with no row covers and have virtual little to no beetle damage. It has reduced the pest population enough that the beneficial insects that are natural predators take care of the few that are here. This is called working hand-in-hand with nature! I find this practice works well for squash plant pests also. Plant squash in a new garden spot where it hasn’t grown for 3 years. Plant the transplants or seeds and cover immediately. Once the squash plants start to bloom, uncover to allow pollinators access to the blooms. Preventing the pests access to the plants slows and limits the damage done by delaying it’s life cycle. Monitoring the squash plants for pest egg clusters and remove or squish when found. Use tape wrapped around your hand with the sticky side out to remove egg cluster. Row cover will also protect newly planted transplants from rabbit and squirrel damage as well as protect seeds planted in the garden from birds. 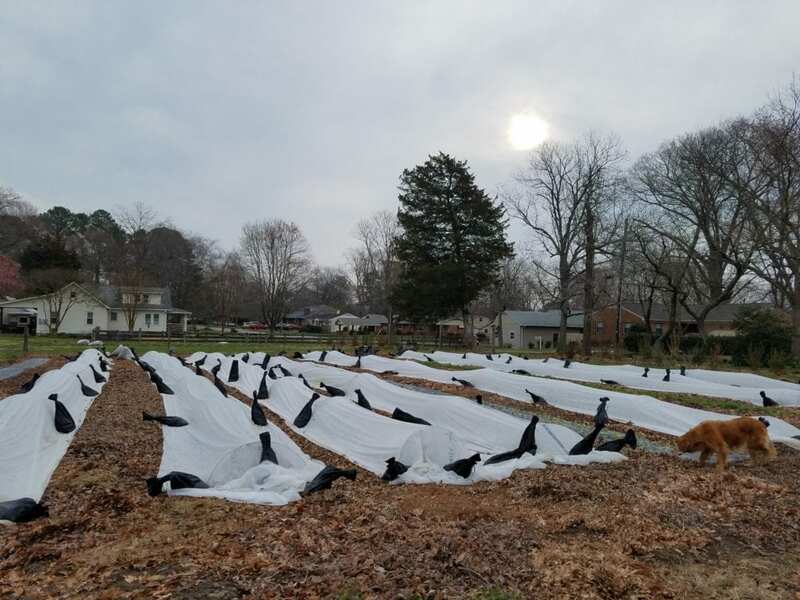 Typically row covers for these uses can be used with or without hoops and stay on until the plants are large enough to take a little damage and survive. Floating row cover offers a lot of perks. I feel like they are my insurance policy. I no longer worry with rabbits eating a bed of transplants overnight or a squirrel digging up young plants, or birds eating my seed. Creatures and pests simply don’t even know what they are missing under the covers! I use floating row covers over my carrots to keep the moose from eating them. It works! Very interesting. I’m going to try your tips. Where do you get your row cover and hoops?